GIFT BASKETS OF FRESH FRUIT & GOURMET ITEMS MAKE THE PERFECT GIFT FOR ANY OCCASION... ESPECIALLY WHEN YOU'RE NOT SURE WHAT TO SEND! Our baskets may included Dewey Bakery Cookies, Mingo River Pecans, Cheese Straws, jams, jellies, Chocolates depending on your choice of products. (Please remember that each selection is custom made and substitutions may be necessary. Your order will be produced as closely as possible to the picture.) 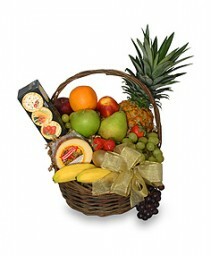 Feel free to call our shop to request specific products in the basket. (Please remember that each selection is custom made and substitutions may be necessary. 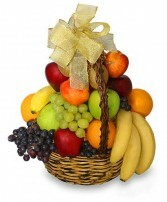 Your order will be produced as closely as possible to the picture.) Our bath and body products may change from time to time. Currently we carry Naked Bee Body Products and Dionnis Goat Milk Products. We also carry bath bombs and other lotions. 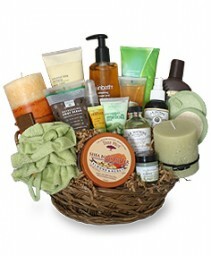 Feel free to call us to choose the products you would like in your pamper me basket!